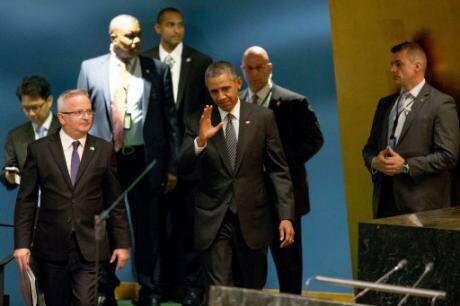 President Barack Obama arrives at United Nations HQ to speak at the Sustainable Development Summit, September 2015.Andrew Harnik/Press Association. All rights reserved.Next week, world leaders will take part in not one but two back-to-back summits on migrants and refugees in New York – one hosted by the United Nations and another by President Barack Obama. Never before has there been such a high-level or high profile global focus on these issues. Then again, never before has human mobility caused so much distress - for those who flee war, persecution and poverty, and for those societies that receive them. These summits are a momentous opportunity to create a more humane, coordinated and durable system for responding to one of the greatest global challenges of our time. So why do I feel nervous? Last year, it was estimated that there were 20 million refugees and 244 million migrants around the world. But beyond the numbers lies a more fundamental challenge. Political instability, economic inequality, uneven demography and globalisation are driving ever-greater human mobility. Yet, despite freeing up trade and capital flows, most countries of the world are seeking to restrict migration and struggling to deal with its consequences. Europe is witnessing the construction of more walls than at the height of the Cold War. Low and middle-income countries struggle to find the resources to host the vast majority (86 percent) of the world’s refugees, while many of our wealthiest states refuse to do more than the bare minimum. Managing the scale, complexity and impact of migration is now an issue that stretches far beyond the remit or capabilities of any one state, or even bloc. So the upcoming summits represent a high-stakes moment. And high-stakes means high risk. The danger we face is that some states will see the summits as an opportunity to row back on their existing commitments. In January this year, Danish Prime Minister Rasmussen pitched the idea of re-negotiating the 1951 Refugee Convention in order to lessen Europe’s obligations towards its relentless tide of sea-borne asylum seekers. There are also several other disputes that need to be resolved before any global agreement on managing migration can be struck. The International Convention on the Protection of the Rights of all Migrant Workers and Members of their Families is one such example. Relating largely to economic migrants and the rights that should be extended to them under international law, this convention has so far been ratified by just 27 states, the vast majority source countries. All major migrant-receiving states remain notably absent. In the prevailing economic and political climate, in which anti-immigrant sentiment has increased, the granting of equal access for migrants to a country’s economic, social and cultural benefits is going to be a tough sell for any politician. And these summits will put the international framework that currently governs the protection of refugees firmly in the spotlight. They present an opportunity for leaders to turn away from obligations that many under-pressure electorates are beginning to see as too onerous. But, any decision to attempt the renegotiation of our existing legal and normative framework would be disastrous. The biggest challenge to refugee protection and the management of large movement of migrants is not the framework, but ensuring that states comply with it. The crucial challenge is to find ways of implementing the commitments already made. I would argue that the 1951 Refugee Convention is one of the greatest achievements of the international human rights system. The only instrument that protects our rights against an oppressive state (other rights are protected by the state), it embodies our fundamental humanitarian values and, despite its age, remains the gold standard for the protection of refugee rights today. If the convention has a weakness it is that no state, in the past 65 years, has managed to live up to the spirit of the convention, let alone its letter in most cases. The outcome of the summits must be one that reaffirms and builds upon existing refugee and human rights law and standards, seeking specifically to set out a roadmap for the practical implementation of countries’ existing commitments. It has to be about sharing responsibility, not shirking or shifting it. Such an outcome will require principled leadership and a deep well of political will. But it can be done. Few people would have predicted that governments would manage to reach a meaningful agreement on climate change – the other great global challenge of the twenty-first century – in Paris last December. Like climate change, managing migration needs a global approach, led by intergovernmental bodies like the UN. It is a far more emotive issue than climate change and, for better or worse, a riskier political challenge for the leaders meeting in New York next week. But I am hopeful that they will reach a Paris style commitment for refugees. 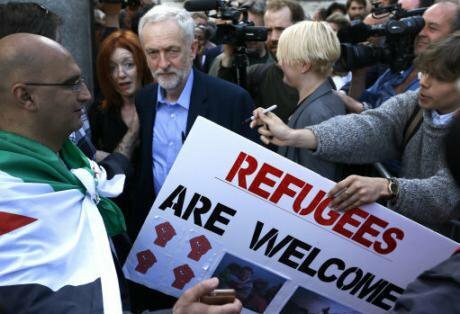 Solidarity with Refugees march in London, September, 2015. (Associated Press/Kirsty Wigglesworth). All rights reserved.On Saturday, just before flying to New York, I will join tens of thousands of people at a Solidarity with Refugees rally in London. For me, rallies like this, and those taking place in cities across the world, are a reminder that there is great support for principled, aspirational leadership to tackle the so-called migration crisis. If our leaders prove themselves ready to navigate the complexities and potential pitfalls of negotiations on this issue, then with high risk, I believe, could come high reward.